Every Humble Texas home and business owner should know who to call when they learn that an armadillo or some other dirty varmint has been digging around in their yard or business landscaping. 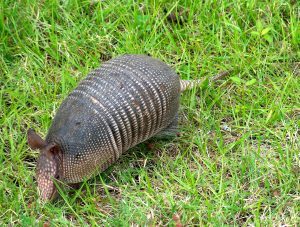 A single armadillo can destroy a lawn, flower garden or landscaped area in no time at all. It’s nearly impossible to get rid of an armadillo unless you really know what you’re doing, so call The Critter Team right away. The Critter Team offers professional armadillo removal, armadillo trapping, armadillo control and armadillo relocation services in the greater Houston area. Landscaping is expensive, so you’re bound to save a lot of money in the long run when you call The Critter Team at 281-667-0171. The Critter Team is a licensed and insured wildlife management company that specializes in the removal and control of all wild animal species, including armadillos, birds, snakes, skunks, rats, raccoons, bats, opossums, squirrels and more. You’re probably wondering why in the world an armadillo is referred to as an opossum on the half shell. Well, the entire body of the armadillo, except for the underbelly, is covered with a boney shell. The flexible bony plates give this unusual mammal somewhat of a prehistoric appearance.Zoologists tell us that there are 20 different species of armadillo. Each of the 20 species has been categorized as a three, six or nine-banded armadillo. The bands indicate the number of boney plated segments common to each of the species. Humble Texas armadillos have nine bands, so they can really dig. The flexible boney plates allow armadillos to dig and burrow through the soil with surprising quickness and agility. No, that armadillo isn’t digging up your landscaping just for fun. They’re hunting for small invertebrates, including worms, earth grubs, cockroaches, mole crickets, beetle larvae, army worms, termites, grasshoppers, yellow jackets, wasps, flies and ant larvae. Armadillos use their pig like snout and peg teeth to dig up 200 pounds of bugs and other critters each year. That’s why you have a hole dug in yard, tunnel in yard or burrow in mulch bed. Armadillos aren’t likely to enter the first trap they come across. There just isn’t any kind of bait that would entice an armadillo to enter a trap. Armadillos are really simple minded creatures. The trap has to be precisely located so that the armadillo pretty much has no choice but to enter the trap. Even then, it will probably take more than one trap to get rid of that ornery armadillo. The traps must be pointed in the right direction and properly prepared. Only an expert Critter Team trapper knows how to read the clues and steer an armadillo into a trap.Nuisance wild animals rarely leave a home or business voluntarily. The sooner you call The Critter Team, the more money you’ll save in the long run. Contact The Critter Team as soon as possible to have that destructive armadillo expertly removed and relocated. The Critter Team specializes in armadillo removal, armadillo trapping, armadillo relocation, hole dug in yard, tunnel in yard and burrow in mulch bed in Humble Texas and the greater Houston area. Call 281-667-0171 to speak with an armadillo control expert. The Critter Team is a veteran owned business that offers humane wildlife removal services, affordable prices and unrivaled customer service.